Inga (Nanna Kristín Magnúsdóttir ) and Barði (Björn Hlynur Haraldsson) decide to get married in a church in the countryside. They hire one bus for each family and guests and a band to play in the party. Inga travels with her parents and brother; her best friend Lára (Nína Dögg Filippusdóttir) that brings her senile grandmother and her flirt Egill (Ólafur Darri Ólafsson); and her mother's mate Svanur (Þröstur Leó Gunnarsson) that has also a secret affair with Lára. Barði travels with his parents and sister Auður (Ágústa Eva Erlendsdóttir); the gay cousin of his father and his mate; and his friends Síði (Erlendur Eiríksson) that Inga Hates and Grjóni (Gísli Örn Garðarsson) that arrives later. They get lost and while seeking the church, the tension increases and secrets are disclosed in the dysfunctional families and friends in the great day of Inga and Barði. 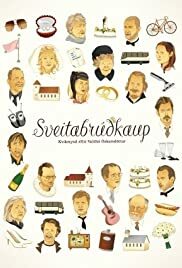 "Sveitabrúðkaup" a.k.a. "Country Wedding" is a witty and acid road movie. The screenplay and the director succeed in developing a great number of characters along 99 minutes running time. The acting is top- notch and I was surprised with many similarities in the behavior of Icelanders and Brazilians. The humor is dramatic and of high-level, and the priest is hilarious. My vote is seven.